Games Meet Metal: HORSE the Band to release 6-DVD set, and you can name the price! Sorta. HORSE the Band to release 6-DVD set, and you can name the price! Sorta. 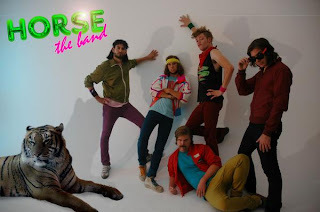 HORSE the band, one of the progenitors of Nintendo-core, are embarking on one hell of an adventure. A marketing adventure, that is. They have documented their last world tour, and are going to toss out a 6-DVD set of the whole endeavor. On top of that, each set is gonna be personalized for each person who orders with ticket stubs, set lists, and whatever ever else they happen to have lying around. The book itself has a starting price of $79, but if you donate more, the band will make a note of it and maybe throw in a bunch more goodies. How are they able to do this? Because they're gonna put this thing together themselves. No labels, no management, no marketing executives. What you get is a product straight from the band and your cash will go straight to them, not a greedy record label. More info, including purchasing info, can be found by clicking here. If I get the loose cash, I'd probably toss them a cool $100.